Graham Turner's epic canvas is the result of years of research and planning, followed by months of painting - click on the Painting Diary link below to see how the painting was created. 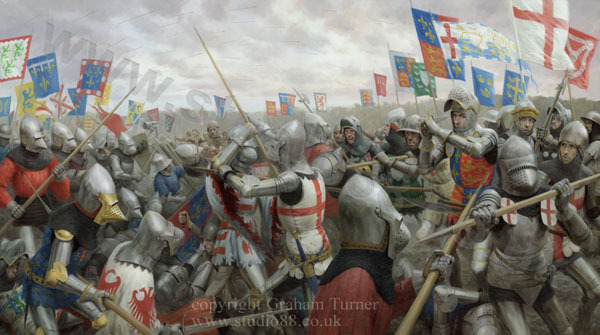 Graham Turner's original oil painting of the Battle of Agincourt is now part of the Royal Armouries Collection and on display at the Royal Armouries Museum in Leeds. 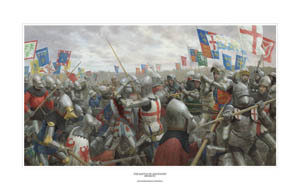 High quality prints reproduced from Graham Turner's painting of the Battle of Agincourt are now available. A special canvas edition is also available, with each reproduction individually printed on very high quality canvas and stretched on wooden stretcher bars by the artist himself, ensuring a picture as close to the original as possible. Two sizes are available, the largest being almost the same size as the original oil painting - a fabulous centrepiece for any room. CLICK HERE for full details and to order. Photo shows Graham with the larger sized canvas. A painting of this size and complexity cannot really be fully appreciated viewed as a small image on a computer monitor, so to give a better indication of the amount of detail in the painting, CLICK HERE to see a selection of larger close up images taken from it. Each image is accompanied by details of what is shown, revealing some of the immense amount of research behind this painting. 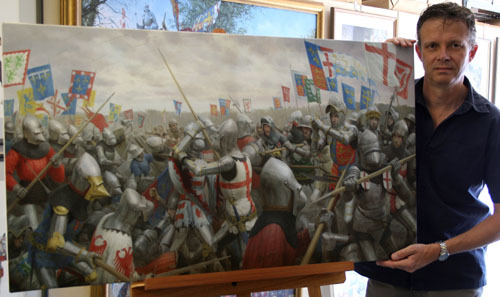 See how Graham Turner transformed a blank canvas into the finished work of art - CLICK HERE to follow the creation of 'The Battle of Agincourt', with stage by stage photos taken as the painting took shape on his easel. 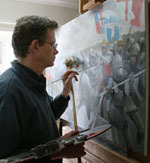 (left) Graham Turner at work on his Battle of Agincourt painting. 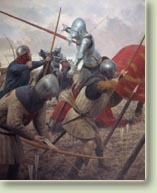 Archers of Henry Vs exhausted army shoot their deadly arrows at the first wave of French cavalry, repulsing their attack and sending the survivors back into the path of the main French army. Four prints are available, reproduced from Graham Turner's pencil drawings of armour from the time of Agincourt.